「マックドナルド」 (McDonalds Japan) is currently offering 「ゲゲゲの鬼太郎」 (Ge-ge-ge-no-Kitarou) toys with their 「ハッピーセット」 (“Happy Set” (Kids Meal)). 「ゲゲゲの鬼太郎」 (Ge-ge-ge-no-Kitarou) is a Japanese アニメ (anime cartoon) that I like. The artist and creator of the 「ゲゲゲの鬼太郎」 (Ge-ge-ge-no-Kitarou) cartoon is 水木しげる (Shigeru Mizuki). 水木しげる (Shigeru Mizuki) was interested in Japanese 妖怪 (ghouls) since his childhood. Many of the characters he draws are inspired by traditional Japanese ghosts and ghouls (just as the West has Dracula, Frankenstein’s monster, etc…Japan has their own monsters). 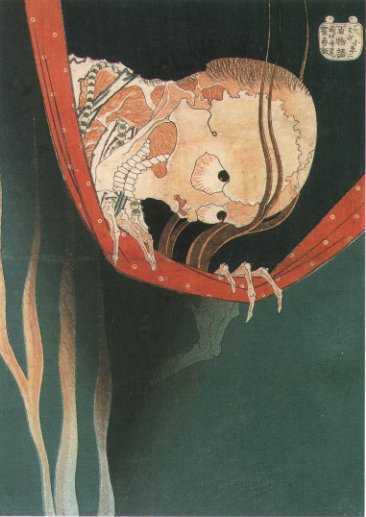 Ukiyoe picture of a Japanese 妖怪 (monster). 水木しげる (Shigeru Mizuki) was left-handed, and drew all of his art with his left-hand, of course…but he was in the Japanese Army during WW2 and he lost his left arm during an Allied air raid. So he taught himself to draw using his right-hand! He has drawn many WW2 cartoons and pictures…and many 妖怪 (ghouls) cartoons. He is most famous for his 「ゲゲゲの鬼太郎」 (Ge-ge-ge-no-Kitarou) comics. 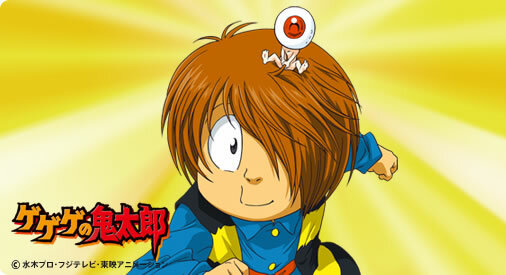 The story of 「ゲゲゲの鬼太郎」 (Ge-ge-ge-no-Kitarou) is about the main character 「鬼太郎」 (Kitaro) who is a 妖怪 (ghoul) with one eye and an assortment of powers who helps protect humans from evil 妖怪 (ghouls). He is joined by his father 「目玉オヤジ」 (Medama-oyaji), who is basically just an eye-ball with a small body, and a group of friends who include 猫娘 (Neko-musume (Cat-Girl)), and ねずみ男 (Nezumi-Otoko (Rat-man)). It’s a fun show. The cartoon is on Sunday mornings at 9:00 (although I seldom watch the cartoon…I did see both of the live-action movies with my family at the theaters). All of my kids are too old for the McDonalds 「ハッピーセット」 (“Happy Set“) so I probably won’t get any of these characters, though. ← Did you hear about…? Yes it is. This month Paris held the ‘Japan Expo’ which gathered for 3 days all Japan entertainment culture, movies, books, comics, animation, clothes and cosplay, music (j-rock, visual kei). I’ve never been there, shame on me! Do you know Detroit Metal City? (Kiminori Wakasugi) It is a manga for metal music fans! Sooo funny ! I know. They showed it on the news here a few weeks ago. >Do you know Detroit Metal City? Yes I love all those horror or not so horror Japanese comic books. Like (I write the authors because I guess titles in French will not help you get it!) Ochazukenori, Kazuo Umezu and my favourite Kanako Inuki (I even have to read some of her work in English because not all her work has been translated into French). I heard that Japanese manga, anime and other pop-culture is very popular in France. Is 「ゲゲゲの鬼太郎」 (Ge-ge-ge-no-Kitarou) popular in France? Repulsive like in “ugly”, I am not sure it is the right word, it is “Kitaro le repoussant”. ^_^ When the no-frills airline over here introduces flights to Japan I WILL make a trip for each season. I wish airplane tickets were cheap…then my family could take more overseas holidays! I would like an inexpensive airline…as long as they were safe. I wonder how the Kitaro character voices sound in English!? Do you have Animax channel there? Some of the seiyuu on Kitaro are ok but some can be annoying with the high pitched voices. Japanese movies are rarely dubbed in English ..THANK GOD! I dont mind watching it in its original voices as long as the subtitle are understandable to read..
>Do you have Animax channel there? No. I’ve never heard of that. Yes, you should visit Japan in each of the seasons! Japan is very different in Spring, Summer, Autumn, and Winter! I think the reason that McDonalds Japan is offering Kitaro toys now is because it’s summer…and in Japan, Summer is known for festivals, fireworks, watermelon…and ghosts! I suppose thats the Japanese version of Halloween? Do you have that festival listed here on your blog? No, it’s not the “Japanese Halloween”. Japan got Halloween a few years ago, and it’s different from U.S. Halloween…but this isn’t it. >Do you have that festival listed here on your blog? If you mean, is Japan’s Halloween events listed on my blog…then, yes, Halloween events in Tokyo are in that post I linked above. But, as for Summer festivals with haunted mansions…it’s not one festival—but many Summer festivals in Japan have it. Haunted mansions, ghosts, ghost stories, scary movies, etc are part of Japanese people’s image of Summer. In the U.S. you can buy just the toy, w/out having to buy the whole meal. But there’s nothing wrong w/ a grown-up buying a Happy Set! Sometimes it’s the perfect amount of food, with a cute toy bonus! I bought Happy Sets when they had the Madagascar toys (I don’t know why, but it tickled me to death that the toys spoke in Japanese!) and Doraemon toys. I love watching Kitaro, i actually like the theme song to it too ^_^ I guess I am never too old to watch Japanese anime. Thats so cute that they have the Kitaro set for the McD meals i sure would have bought the set itself. Say is the live action movie worth watching? I didn’t know they showed Gegege-no-Kitarou overseas. Of course, it’s shown in Japanese here…but do you watch it in your language? And yes, the movie and the sequel were very good. Over here we have a Japanese anime channel called Animax and right now they’re showing Kitaro. Its English dub but we can choose to watch it either in English or Japanese..because there’s no subtitle to it I watch it in English 🙂 I’ll have to look out for the live action movie at the dvd shop then. Ive got too many movies that ive yet to watch ..
I’ve never seen a Japanese show or movie dubbed in English, except Ultraman when I was a kid.